I see a lot of 'What's Inside My Bag' videos on Youtube and it is one of my favorite videos to watch. It's so interesting to see what is it that people carry in their bags on a day to day basis. I did one of these years ago back when I had my first Tumblr account and it was so much fun to share. I thought it would be a good idea to do a more in-depth one and share it here. I'm such a neat freak I always trying to keep my purse clean and neat even though that doesn't always happen. I try to clean out my purse at least once a week since I usually accumulate tons of receipts inside. I love having big purses and that's typically what I use. I tend to catch myself adding a whole bunch of unnecessary things into my purse which ends up making my bag so heavy! By the middle of the day my shoulder and neck are aching. 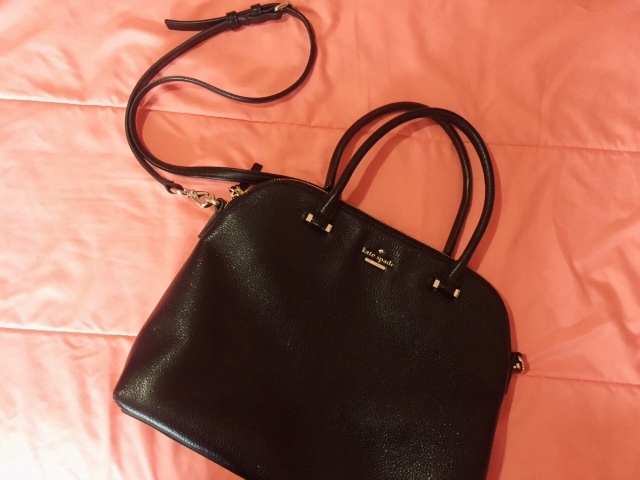 I am currently using a Kate Spade New York purse that I got for my birthday. This varies especially since I consider this bag to be on the fancier side, but as of late, this is the bag I have been carrying around. I love it. It is so clean looking, black leather and very spacious inside. I love that it also has straps since that is the way I usually like to carry my purses over the shoulder. First thing I always make sure I have in my purse is my wallet. There is no point of even leaving the house without this because you won't be able to go shopping haha. This is a Marc by Marc Jacobs wallet. I have been wanting to get a Kate Spade wallet so it can at least match in brands since I don't really like to cross designers. Maybe I'll be picking up a new one sometime soon. Sunglasses on a sunny day when the sun decides to blind me even more while I am driving. Powder compact for any touch-ups along with chapstick. My lips always get so dry and I would go crazy if I didn't have a chapstick at hand. I like to carry my iPad often especially to keep me entertained. I'll do some reading, catch up on what is going on with my family on Facebook, or my favorite watching Youtube tutorials. I've been carrying around this new 2016 planner I purchased at Target that I spoke about on my monthly favorites. 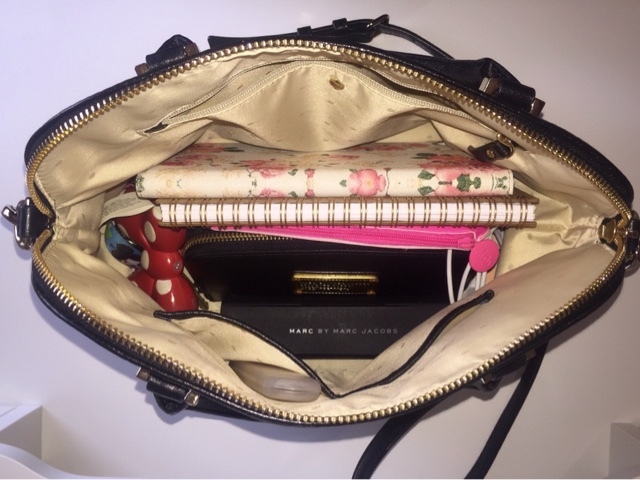 It fits perfectly inside my purse and I've been liking having this with me to write down ideas of what to blog about along with birthdays so I never forget. With any notebook, you will need a pen to jot down ideas. This really cute Minnie Mouse pen I got at Disneyland. It comes in a set with a red Mickey Mouse and a white shaped heart. I couldn't pass on them. My car keys. A friend of mine sent me this cute Alice in wonderland lanyard. I love it. Phone Charger. This really comes in handy if you ended up being on your phone all day long and still aren't home to recharge. I feel safer knowing I have this with me. I also carry this really cute scalloped pink bag that I got from Ipsy. Inside I keep a few random items such as hair ties, bobby pins since they're so easy to lose, lipsticks in case I somehow forgot to apply some before I left the house and finally some earbuds so I can listen to my music in peace. I hope you guys enjoyed taking a peek at what's inside my bag. What are some of your essentials you carry around?